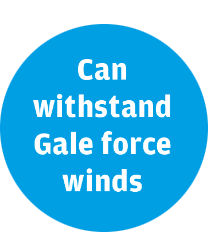 Independently tested to withstand gale force winds! 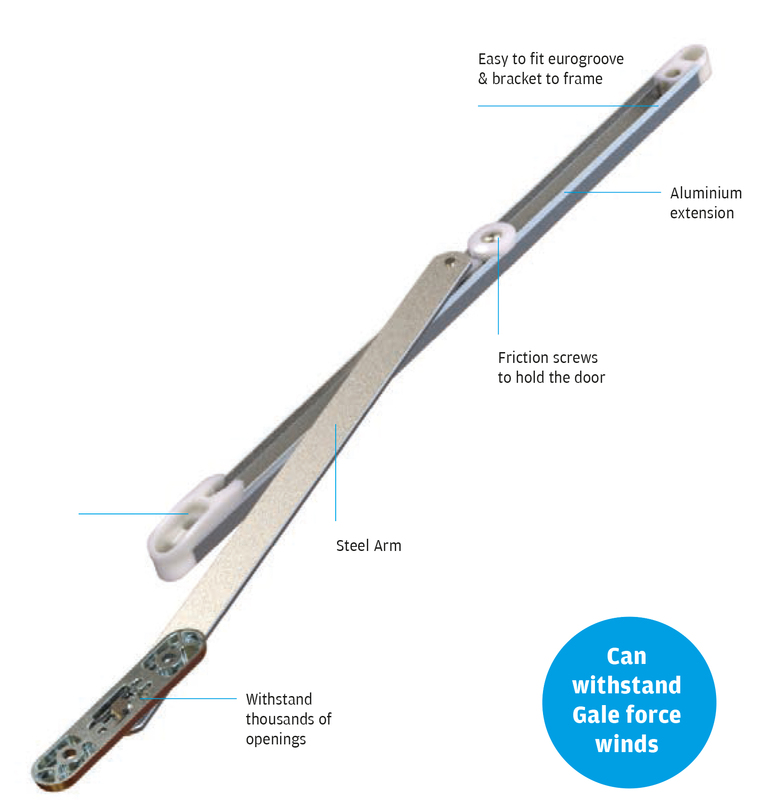 The fantastic UAP Door Stay has now been tested to withstand gale force winds, making it in our opinion the best product on the market! The restrictor limits door opening to a preset position, or to a maximum of 90 degrees, and includes an easy-to-fit eurogroove and bracket to frame. Our Door Stay is perfectly suitable for all major uPVC profiles, and measures 335mm in length. It can withstand literally thousands upon thousands of openings without becoming damaged, and does not become affected by daily wear and tear! 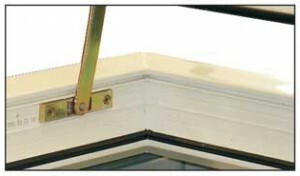 Additionally, a carefully constructed slider contains special friction screws to hold the door open in mild wind conditions, so that it remains stable and steady. The Door Stay really is in a league of its own as far as door hardware is concerned, and we are ever so proud of what we have achieved. When it comes to furnishing consumers with quality products at reasonable prices, we are a cut above the rest! And the fantastic Door Stay is the perfect example of this! 2. Position the striker plate behind the bead groove on the outer frame 45mm from the corner and screw into position. 3. After hanging the sash, clip the arm of the UAP Door Stay into the striker plate. 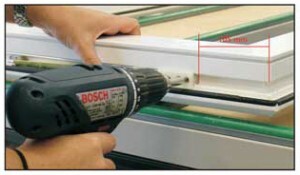 Note – Should additional friction be required, simply tighten the hexagon screw within the UAP Door Stay. This machine tests the corrosion resistance of the door stay. The salt spray cabinet produces a corrosive environment, by releasing a dense saline fog into the chamber which the door stays are exposed to. This creates an accelerated corrosion of the door stay and allows us to test how well the door stay would stand up in harsher environments. The door stays are tested for 480 hours. The door stays were mounted on representative sections of PVCu door profile. These were then installed on a test fixture such that loads could be applied representative of those seen in service. The Door Stays were installed in accordance with the UAP fitting instructions. The loading position was at 375mm from the hinge edge of the dummy door. This would be the centre line of a typical 750mm wide door. The initial tests were to determine the load to overcome the detent holding the door open when the load was applied in the closing direction. The first series of tests were carried out with the fiction slider set in the loose position as supplied. A second series of tests was then carried out with the slide tightened such that a 10N operating load (on door centreline) was required. The stays were then tested with the load in the opening direction. In this instance the load was increased to destruction. Note: with tightened sliders the dummy door operating effort was 10N at the centre line. In all cases the Door Stay operated without damage. In all instances the moveable arm became detached from the slider pin. A typical door will have an area of 1.5m². To force open the door with a failure load of 524N would require a wind pressure of 349Pa. The actual wind pressure for a door can be calculated by the methods in BS 6375 using location, orography and the building design. This can vary widely throughout the UK. The first two test pressures are those used to record the doors air and rain leakage. So these are the figures which will often be encountered in use. P2 is used for a repeated pressure test again at a pressure level often encountered. The pressure P1 is used to measure the deflection of the door in high winds such that sealed units and similar are not damaged. Pressure P3 is based on the peak wind pressure that would occur once every 50 years and requires the door to be safe at this pressure. Given that the door is unlikely to be left open during periods of high winds, the pressure P2 is likely to be the worst that the Door Stay would encounter in general use. 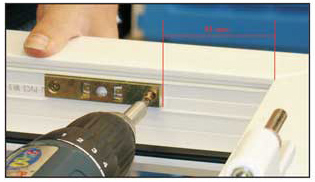 It can be seen that the Door Stay would not prevent the door from closing in the worst conditions utilised in these test pressures. However, doors are not likely to be left open in extreme conditions. Also, should the slider be set correctly, the door will close gently rather than slam shut. To force open the door and break the stay would typically take around 350Pa. It can be seen from BS 6375 this would equate to a wind speed of around 19.3m/s. Whilst, the Door Stay would fail at a high wind speed it is unlikely that a door would be left open in those conditions. When applying a closing force to the Door Stay, the stay would yield with a typical pressure of 20Pa. In this instance, the Door Stay is not damaged. When applying an opening force to the Door Stay, the stay fails at a typical pressure of 350Pa. This equates to a wind speed of around 19m/s (42.5 miles per hour). UAP Ltd distributes a wide range of door security products, including but not restricted to door chains; door restrictors; cylinder guards; door stays; door closers; cabin hooks; security mail bags and rack bolt sets. 1. The door security products are applied to a window, door or door panel, and no item of door or window furniture on the window, door or door panel are sealed or fixed using any form of silicone sealant or the like. 2. 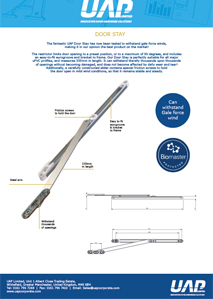 The door security product is fixed correctly and the right way around using the correct fixings, and are not scratched or damaged at any time during the installation process or thereafter. 3. The door security product is installed inland (defined as 25 miles from the coast or 5 miles from highly populated industrial areas) and are cleaned monthly with a moist cloth. At no point should any form of cleaning agents be used. 4. 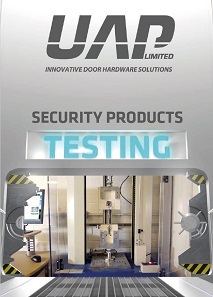 No claim will be accepted for any door security product that is scratched or mutilated or fitted incorrectly. 5. The guarantee only applies if the door security product is fixed to the original window or door for which it was bought and fitted by the installer. The guarantee will cease immediately if the door security product is removed from the original window, door or door panel. 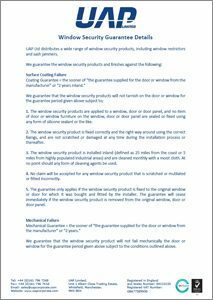 We guarantee that the door security product will not fail mechanically the door or window for the guarantee period given above subject to the conditions outlined above.